Recently got into fpv drone flying. After building my first drone and getting ready to fly I crashed 1 minutes after takeoff. No loops, punched throttle or anything like this was done the entire flight. 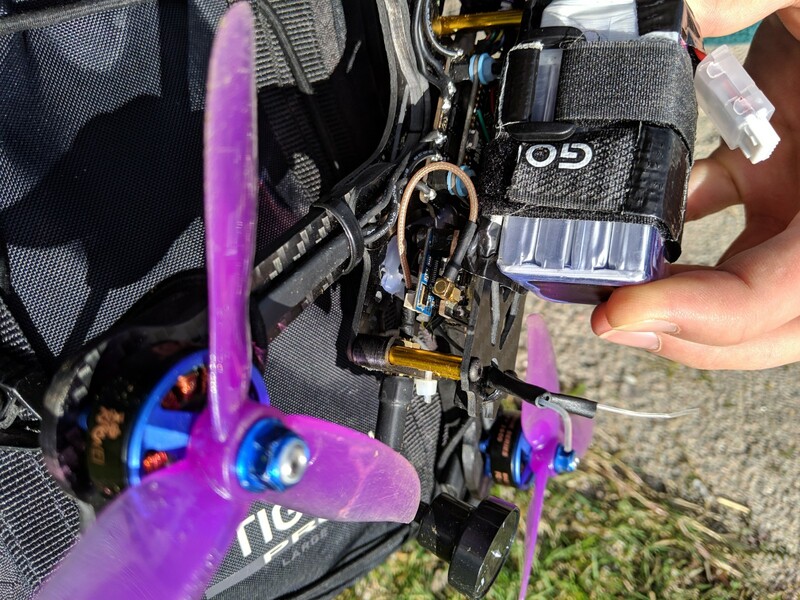 From very slow flying (<20km/h) the drone suddenly went into the spiral of death, and took a hard hit. Exact same thing, however 2 minutes of flight this time. What I can read from other forums, this normally happens after loops or hard punches - something with d sync? - however I'm not doing any of this, when flying. I have uploaded screenshots of the incidents, and hope any of you can make sense to this, as I can't find anyone with the same problem. 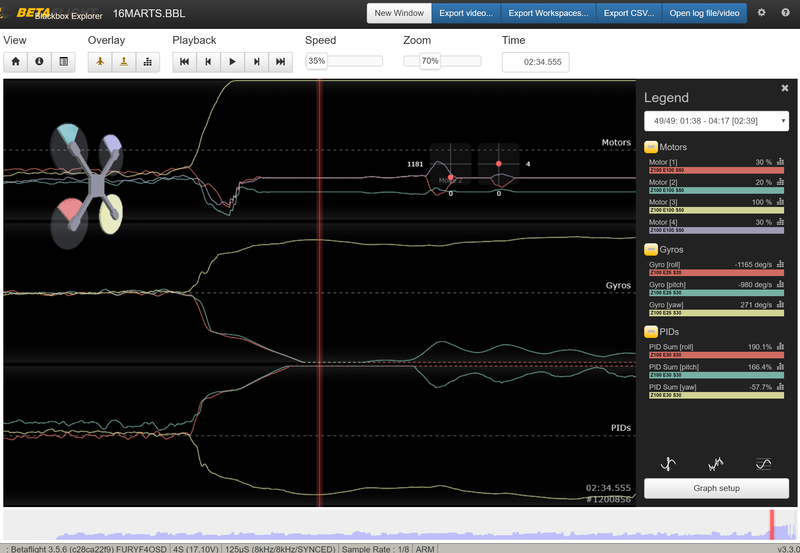 It seems one motor goes full throttle at 100%, and the 3 other motors goes to steady 20%, 30%, 30% until crash. The two graphs are almost identical. have you calibrated the esc's? Is the motor that is going full throttle warmer than the other motors? Maybe also check for ground on the side of your esc towards motor. there should be none. It sounds like a fail safe situation. They act just like a desync where the craft stalls, one corner dips, and it tumbles to the ground. I would inspect the receiver antennas for damage. Make sure they are oriented 90 degrees apart, and not have be blocked by carbon frame or battery. Pictures would help us better help you. Its a strong possibility specially if this occurs doing the same thing or pointing the same direction. 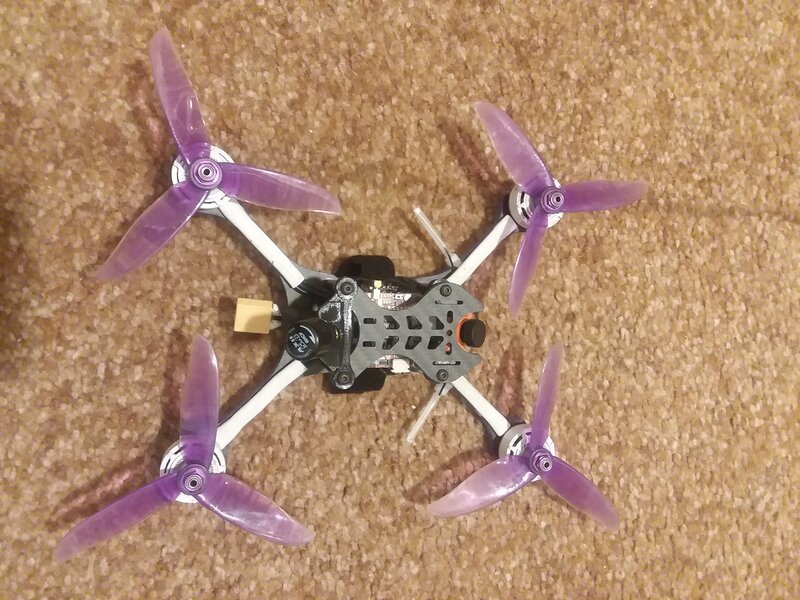 I had a runner 250 when I started to fly with a broken antenna that would roll over and drop every time the frames left side faced me. Also thank you PsyBorg for the reply! It sounds like you are on to something here. I am actually almost 100 % sure both incidents happened when the drone was going towards me, thus facing my direction. I will test this again tomorrow, to be sure. Antennas are 90 degrees apart and secured with shrinking tape. 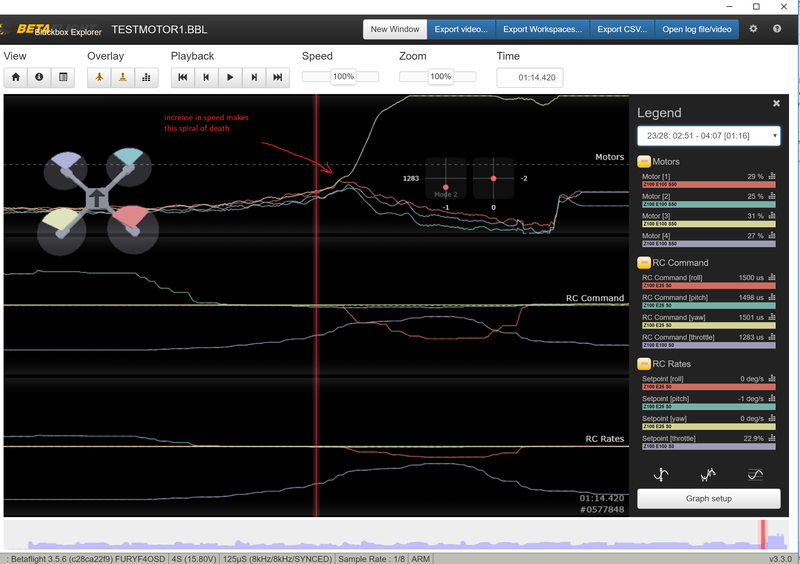 edit: regarding fail safe, shouldn't all the motors go to 0% and not the carractaristic 100%, 30%, 30%, 20%? I had exactly that on my first quad - it was down to a slightly poor connection to the motor from the ESC. The sub-quality solder joint only showed itself when stressed and caused the motor to de-sync. The log file shows the command from the FC to the motor to increase it's thrust to level the quad but of course with the motor now de-synced it's not giving any thrust, so the command goes to the roof on that motor and the other three reduce in an attempt to get balance again. I would first calibrate your esc's. Read instructions from your esc maker for how to do this. 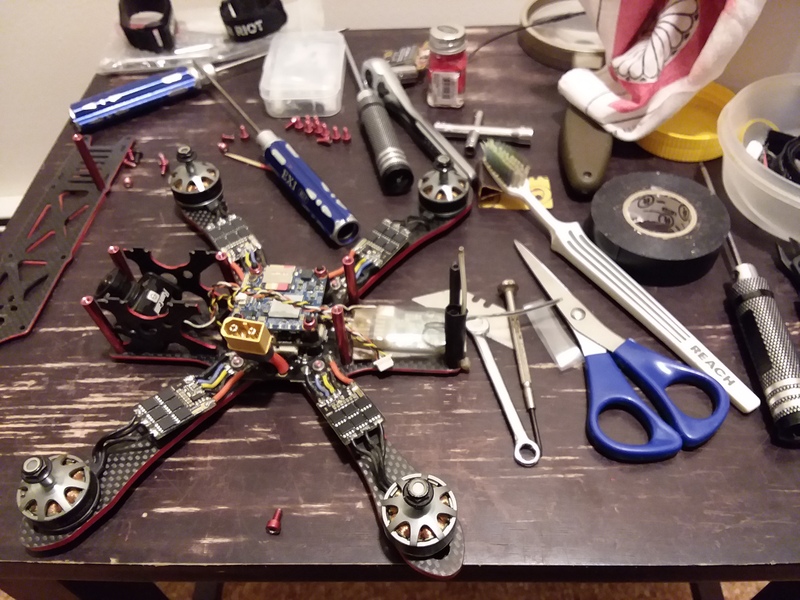 If that doesn't help, WITH THE PROP OFF go into betaflight and goto motor tab and manualy spin up the motor in question. spin it up and down near 30 or 40 percent for a minute or two and see if it stutters or beeps or stops or anything. Compare it to how the other motors operate. check for heat on esc and motor. warm is fine hot not so good. while you are doing this you can check connections to the esc's and motors just by pushing the wires around a little easy or with a meter. What kind of radio? Are you getting rssi warnings? Thank you again for reply! I did some flying and have encountered the same problem 2-3 times more now. I am able to "force" the spiral of death incidents, if I increase the throttle regardless of the way the drone is facing in the air. 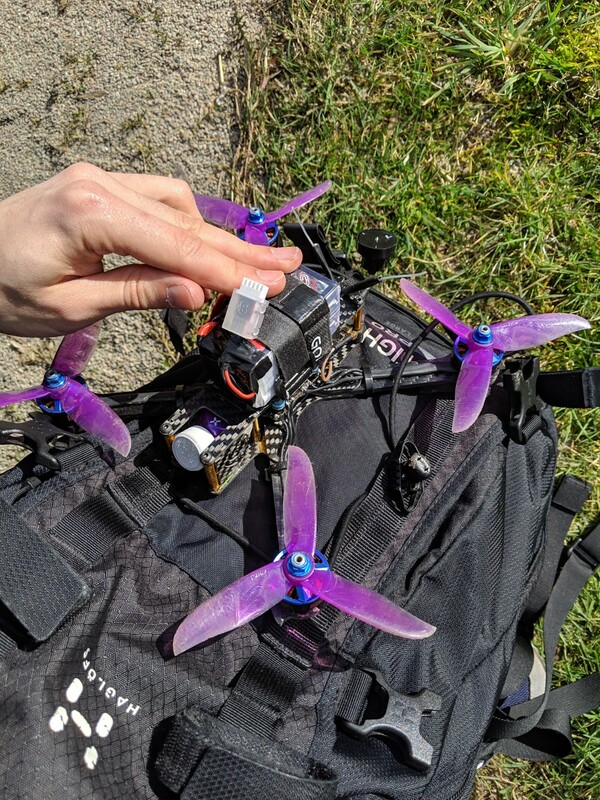 I did some spin test without props and one motor 4 seems to get hotter than the others and problem motor (motor 3) seems to be the slowest of them all. I re-did the soldering yesterday, increased motor throttle idle value but non of this has changed the outcome. 99% positive this is a fail safe. Works fine low altitude. As soon as the frame gets between the antennas and the radio it tips over n plays dead. Mount them like the Alien with one straight up and the other out the back or like the Mach1 and my other racers off the front arms to get 90 degree AND more separation from the fpv antenna pumping power signals right next to them as you have yours now.